Activities: Information and photos from meetings, retreats, shows, etc. 6:30 p.m. - Doors open at 6:00 p.m.
AVQA meets at Lancaster United Methodist Church, 918 West Ave J, Lancaster, on the 2nd Thursday of each month, starting at 6:30 p.m. Please come join us. Please remember to wear your name badge and AVQA pins. Any borrowed books should be returned to the librarian. 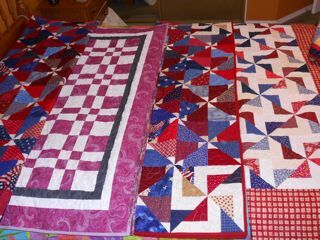 Apr 11 Longarm Presentation/Learn how to make quilts ready for quilter. with cut out windows. I made the furniture from old match boxes. From the scrap bag came the curtains, bed covers, tablecloths and whatever else a well decorated house could need. I fashioned my dollies’ clothes and learned to use a needle and thread. 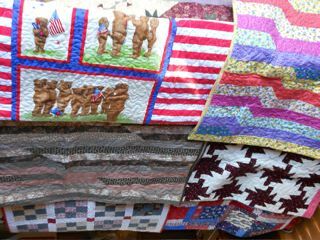 Preparing Your Quilts for the Quilter! Fast forward to my teenage years. Money was tight. Together, my mother and I fashioned several prom dresses that were the envy of the rich girls and their store-bought gowns. When wedding bells were ringing, I made my bridal dress as well as the dresses of my six bridesmaids. At college, I finished my major classes (Psychology) by my junior year. During my senior year, just to earn credits, I wandered over to the department where - you guessed it - I took every textile class available; everything from color theory to weaving. Fast forward to my girls both being in school. I decided to try my hand at quilting. 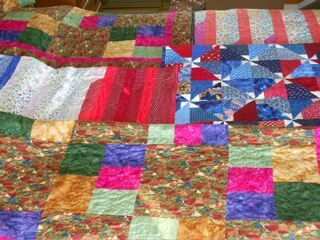 One quilt and I was hooked. I'm basically a self- taught quilter. I've learned by experimenting and doing and reading. 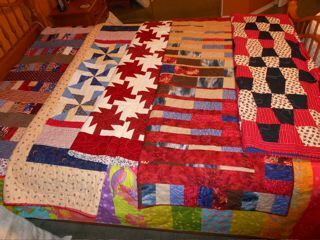 Hundreds of quilts later, my grandmother's words still echo in my ears: "waste not, want not.” My favorite quilts are scrappy, both random and planned. The fabrics used are often repurposed from clothing - everything from t-shirts to favorite baby clothes to blue jeans to men's shirts. There is some scientific evidence that sleeping under weighted blankets enhances the quality of sleep, much the same principle as swaddling babies. There is no better "weighted" blanket than a quilt. 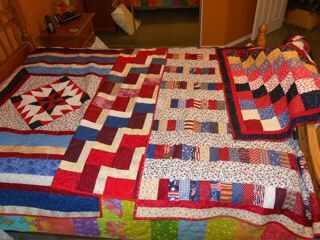 If my quilts can provide warmth, a good night’s sleep and security as well as homespun beauty, I'm happy indeed.